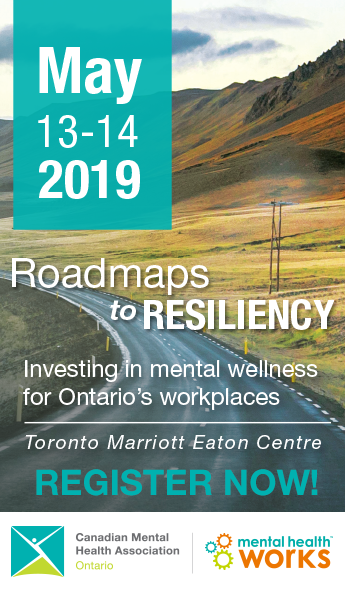 Canadian Mental Health Association, Ontario Division will bring together leaders, managers, employees, researchers and experts in the field to discuss emerging best-practices and practical, on-the-ground skills that will develop resiliency with its 2019 workplace conference, set for May 13-14 in Toronto. Hosted by Mental Health Works – a national social enterprise led by CMHA Ontario – Roadmaps to Resiliency: Investing in Mental Wellness for Ontario’s Workplaces will be held at the Marriott Downtown at CF Toronto Eaton Centre and will focus on resiliency and how to build it and manage it in the workplace. Keynote speakers will include trauma psychologist Dr. Jonathan Douglas, experienced leader in workforce productivity Dr. Bill Howatt, mental health awareness non-profit The Brainstorm Revolution Troupe, and disability management and mental health expert Addie Greco-Sanchez. Day 1 of the conference will also feature separate employee and employer panels. The employee panel will feature representation from first responders, military, health care, journalism and unions, with each member bringing unique perspectives and experience promoting, receiving and advancing mental health in the workplace. The employer panel will include leaders from mental health care, policing, financial services and public service who will discuss the evolution of mental health supports in the workplace and the role of management and leaders in further advancing psychological health and safety.